In POS / POP display creation several different types of material are used. Plastics come in a wide assortment of options each with its own advantages and disadvantages. 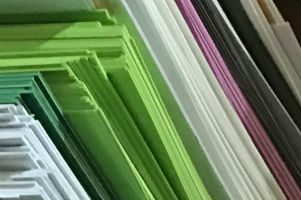 Here is a brief overview of the common types of plastic used in POS / POP display creation. It is important to note that what plastic is best greatly depends on the displays intended purpose, design, and environment and that what works in one situation may be unsuited for another. PETG PETG is a strong material with 70 percent of the impact resistance of Polycarbonate, is very durable, is generally affordable (but this can vary), resistant to dropping and impact damage, recyclable, and biodegradable. PETG can yellow if improperly made, cannot be polished, more prone to scratching than acrylics, and if printed on cannot be recycled. Acrylics Acrylics scratch less, can be polished, are available in a variety of colours as standard, generally affordable, flexible, and far easier to bond than some other choices such as PETG. Acrylics key disadvantage is that while 17 times stronger than glass it can be brittle when compared to other plastics such as PETG and be broken or cracked when dropped or too much force is applied. Also hard to recycle and if printed unable to be recycled. Silicone Silicone is longer lasting than other plastics in general, has a high resistance to temperature changes without degrading, has a variety of colour choices, and is a flexible material. Silicone plastic doesn't biodegrade, is difficult to recycle, and depending on its use can be expensive. Also somewhat specialised in terms of its uses. Polycarbonates Polycarbonates are stronger than other plastics with 250 times greater impact resistance than glass, flexible, and resistant to heat and cold. Cannot be polished, weak to solvent cleaners, hard to recycle, can be scratched or dented, and depending on the project can be expensive as well. PVC PVC is a versatile material with several advantages. It is lightweight, tough, moisture resistant, has good impact resistance, and is easy to shape and install in a variety of configurations. PVC has two key flaws. One it can be damaged by high temperatures and two it can also be weakened by UV rays making it unsuitable for outdoor displays. The above information is intended as a general overview of various types of plastics used in POS / POP display and design. However, developments in technology, production, and market factors can change this information. Always consult an industry expert before making any design or material choices. Plastics offer a wide variety of materials to use in your POS / POP displays. However, not all plastics are suitable for every display. As with any other material certain designs require certain plastics. When designing a POS / POP display you want to work with an industry expert who can help you pick the best materials for not only your design but how you intend to use it. 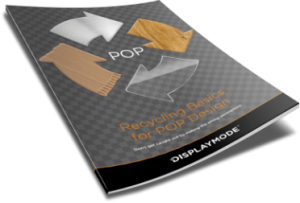 DisplayMode has the experience and expertise needed to pick the best materials for your POS / POP displays. Contact DisplayMode today on +44 (0) 1536 460805 or contact@displaymode.co.uk to learn more.